The Trailer Leaf Spring Hangers and Hanger Kits below are ideal for Weld-On Trailer Applications for both Slipper Style Leaf Springs and Double Eye Leaf Springs. These Weld-On Leaf Spring mounting hangers are for 1 3/4 wide Leaf Springs using 9/16 inch Diameter Spring Bolts. Everything in this category is Raw Steel other than the equalizer Bars, which are painted steel. Items in this category are also perfectly suitable for utility and enclosed land trailers. 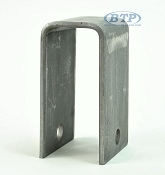 You will most commonly see these parts on Painted Steel Boat Trailers. 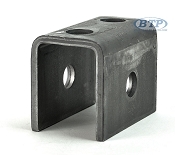 They are welded to the frame of the trailer to mount your trailers leaf springs. Most commonly you may have to clean off the current surface in order to weld. These parts can be coated and painted to match your trailers paint. These Parts are intended for either Slipper Springs or Double Eye Springs.